You don’t write because you want to say something, you write because you have something to say. Blaugust has come and gone and many blog posts were written. We can rest from writing all of those posts now on Labor Day… at least here in the US. Despite the entry for me on that post I actually posted 40 times during August, which exceeded even my usual excess of posting. 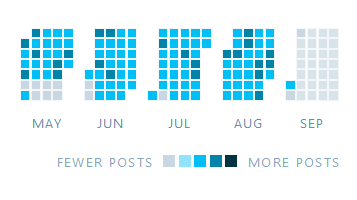 The days in light blue are one post, the days in darker blue are two posts. I generally try to avoid three posts on a day unless the situation demands it. I have only done so once this year. Those days appear as black. So I didn’t miss a day in August and, when it came down to it, I only missed one day in July and two days in June… and I was on a cruise for a week in June. I was on a 55 day straight posting streak until yesterday I guess. Anyway, getting in a post a day for the event earns you the Rainbow Award. Now to keep an eye on all those people who joined in on the event. I know a few quit part way into the month. Blogging is work. It takes time from other things. Unless you’ve been bitten by the writing bug and caught the inclination, fever, obsession, or or whatever you want to call it, it can be tough to carry on. But that is fine. Not everybody has to go crazy and we need people to read, like, and occasionally comment as well! I think the article about finding the time over at Contains Moderate Peril is a good post about that sort of thing. People generally find the time to do the things they really want to do. As for posts about Blaugust and blogging itself, I managed to get in a few. I generally don’t have a problem coming up with something to post about, but making myself post about a specific topic when I don’t feel it is another story, so I strayed from the suggested topics more and more as time went on. It Is Blaugust and What Should I Even Write About? The month itself even saw a boost in page views, comments, and likes here at TAGN. As I said before, it is gratifying when some extra work has some noticeable difference. I even participated a bit in the Blaugust Discord channel. That is a bit unusual for me. Despite being a blogger, an undeniably extroverted endeavor, I tend to be very quiet in groups, and the more people in the group the less I am likely to say. I think Discord worked out better than Anook did in previous years. Anyway, a hearty cheer to those who participated in some way. I will list them all out below one last time this year. While 90 blogs were signed up, only 88 ended up with something to which I could link. RSS feeds for all of the sites can be found at a post over at Armagon Live. We shall see who comes back for another round next Blaugust. 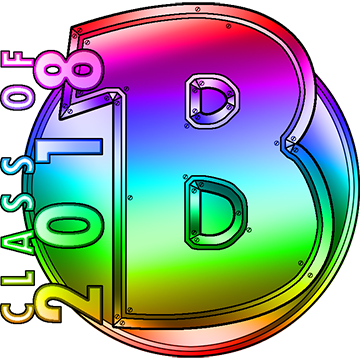 This entry was posted in blog thing, entertainment and tagged Blaugust on September 3, 2018 by Wilhelm Arcturus. I do like to see quote from Scott Fitzgerald. I wonder what he’d have been like on social media? I thought Discord worked better than previous options, too. I was on there a few times in the first half of the month but I kind of forgot about it as time went on. It tended to be pretty quiet at the times I was there, which is why I drifted away. Handy to have it installed, though. We seem to have dropped Teamspeak in favor of Discord for World vs World on Yaks Bend and yesterday when I signed up for Twin Saga it automatically added me to a Discord via Steam so I guess I might as well get used to using it. So just a word to the wise. Blaugust was great, and it helped me realize what I want to do with my blog, BUT…. It started in the month that one of the most popular MMO’s on earth decided to drop an expansion. I had to quit for a bit because of that. Now my father in law dying is an entirely different subject, that’s not really on the event. I made a goal, and I accomplished half of it. I wasn’t able to post every day, but I was able to find a reason to write, and I think that is good enough for me. @Bhagpuss – I was looking for a different quote about the compulsive nature that writing has for some people, but figured something from him served well enough. @Jeff – I am not sure what the word to the wise was out of that. I think WoW dropping an expansion actually gave some people something to write about. Lots of new topics came up out of the expansion.